He reminded Malaysians to remain vigilant against those who are bent on promoting discord and religious tension in the country. KUALA LUMPUR: Malaysians have been reminded to remain vigilant against those who are bent on promoting discord and religious tension in the country. 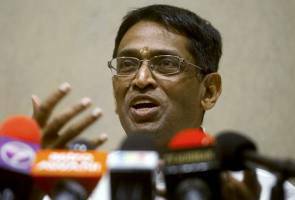 Commenting on controversial preacher Dr Zakir Abdul Karim Naik who is scheduled to hold talks at several locations in the country, MIC president Datuk Seri Dr. S. Subramaniam said the established agenda of the likes of Zakir Naik have been foreign and should remain foreign to the Malaysian agenda. "We have been promoting racial and religious unity in Malaysia and till date,despite some episodic challenges we have managed to preserve the fabric of the Malaysian nation that we love," he said in a statement today. He also thanked the Home Minister and Inspector General of Police Tan Sri Khalid Abu Bakar for cancelling the Mumbai-based preacher's scheduled talk in Melaka on Sunday. Khalid in a tweet earlier said Zakir Naik's programme this weekend is not allowed to take place as scheduled. He cited public order and religious sensitivities as the reason not to allow the preacher to deliver his speech. The preacher is supposed to hold a talk at Universiti Teknikal Malaysia Melaka (UTeM) on Sunday, Apr 17. Yesterday, the MIC Youth had lodged police reports on the talk and called on the police not to allow the programme to take place. MIC Youth chief C.Sivarraajh said the wing was disappointed with UTeM for inviting Zakir Naik. "Zakir Naik is known for his demeaning tactics to undermine other religions that could spark unrest without weighing the respect and sensitivity of others," he said in a press statement. Penganalisis: Berakhirkah perikatan Barisan Nasional?